An exhibition of official Irish posters created by U2's own design team will go on display this week at The Church venue in Dublin City. Entitled 'Light of Home - A U2 Design Exhibition', this exhibition is based around the band’s Irish posters from their last number of tours designs by AMP Visual’s designers. It's being held in association with #WelcomeToTheNorthside at The Church Bar with AMP Visual. AMP Visual are U2’s graphic designers and have proudly worked with the band throughout their career and, the exhibition displays a sample of the creative work undertaken with the band. 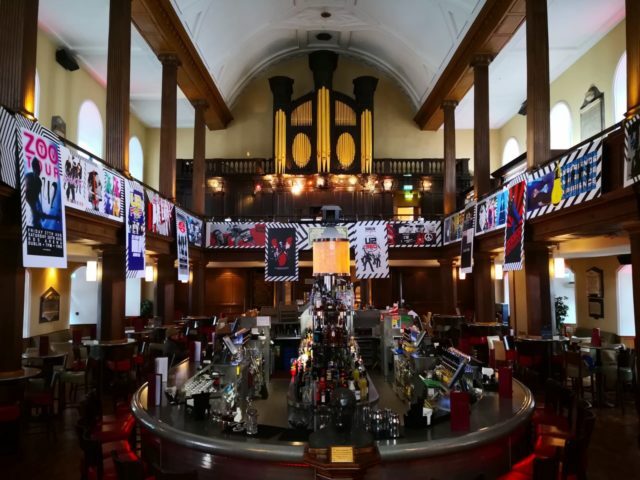 The Exhibition takes place in a week where The Church Bar becomes a fan meeting point for U2 fans while visiting Ireland for the eXPERIENCE & iNNOCENCE Tour at the 3arena. #WelcomeToTheNorthside have been entertaining U2 fans there for the past six years with great success and growing bigger every year. “The exhibition is a highlight of the writ large and the ostensibly quiet. It’s a visual journey,” says Shaughn McGrath of AMP Visual. Along with the Exhibition, fans can enjoy Free shows from top Irish and international U2 Tribute acts and sip a U2 Cocktail in the Pop-up U2-themed Bar, “Hangover Quay”. • 8th Nov - DJ Eamonn Jabbawookie Barrett U2 Fan Meet up in “Hangover Quay”, Our U2 themed Bar. U2 Themed Bar open all week of Nov 5th. There's free entry to all their live gigs. But tickets are required for U2 Quiz see their Facebook events page for details.